Thanksgiving is right around the corner and that means I get to set up an amazing tablescape for the family dinner! I absolutely love Thanksgiving. 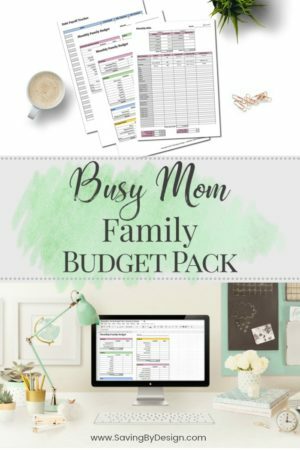 My husband and I love to host it every year and I just love everything about setting up my menu, getting a kids’ table ready, and of course, making an amazingly festive Thanksgiving table. These Thanksgiving tablescapes will inspire you to create an absolutely mesmerizing Thanksgiving spread that will wow your entire family…and many of these items you’ll be able to do on the cheap, which is always important in my household. Have fun with decorating your Thanksgiving table and be proud of your creation! 1. 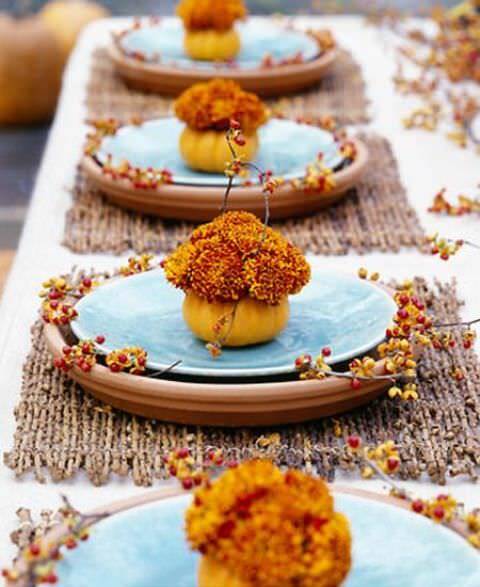 These Mini-Pumpkin Flower Holders are such a great way to bring a splash of color to your Thanksgiving table. 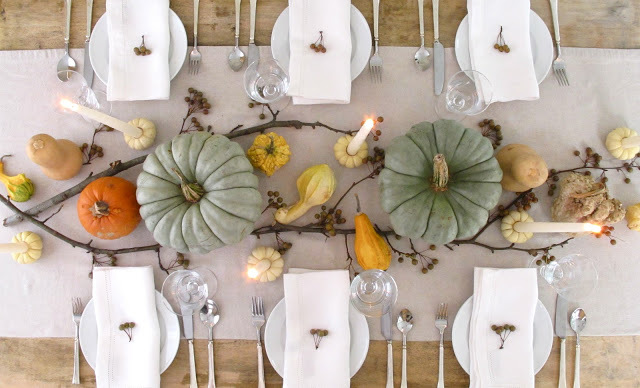 DecoratingYourSmallSpace.com has the great ideas for a Thanksgiving table! And best yet… it helps to repurpose all of those mini-pumpkins and mums that have been decorating my porch this fall during the Halloween season. Wonderful! Grab some gorgeous twigs like the one in the above photo at your local Dollar store, and your table will look like a million bucks! 2. 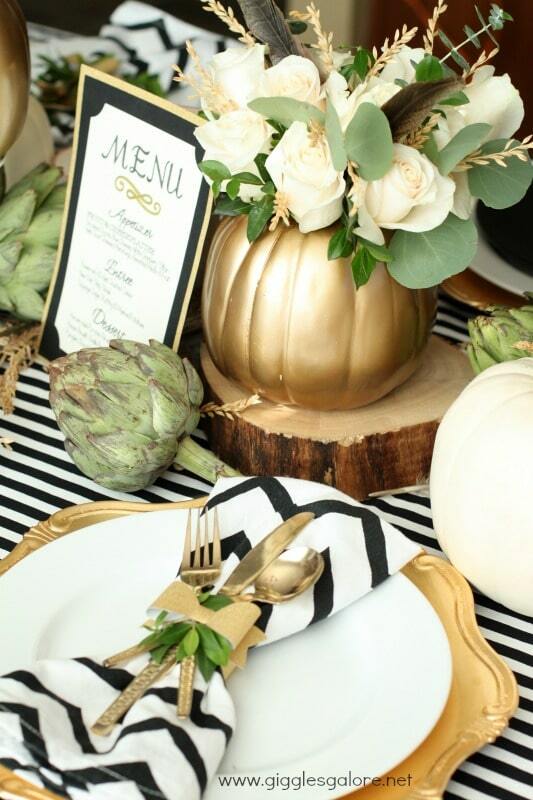 This Black, White and Gold Thanksgiving Table from GigglesGalore.net is the epitome of fancy and fun! I absolutely love the wooden coasters that the painted gold pumpkins can sit on, and having the black and white stripes as a base really brings this table to life! Bring in some flowers, succulents, and fresh sprigs and you get the green embellishments that will knock everyone’s socks off. 3. Why not add a pop of color in your Thanksgiving Tablescape? That’s what DukeManorFarm.com did in their great idea above. I love how the orange pops of color around the table brighten everything up. What a great idea to have a little sunflower at everyone’s place setting/ Layer it with a simple burlap table runner and you have yourself a very pretty table for your holiday! 4. 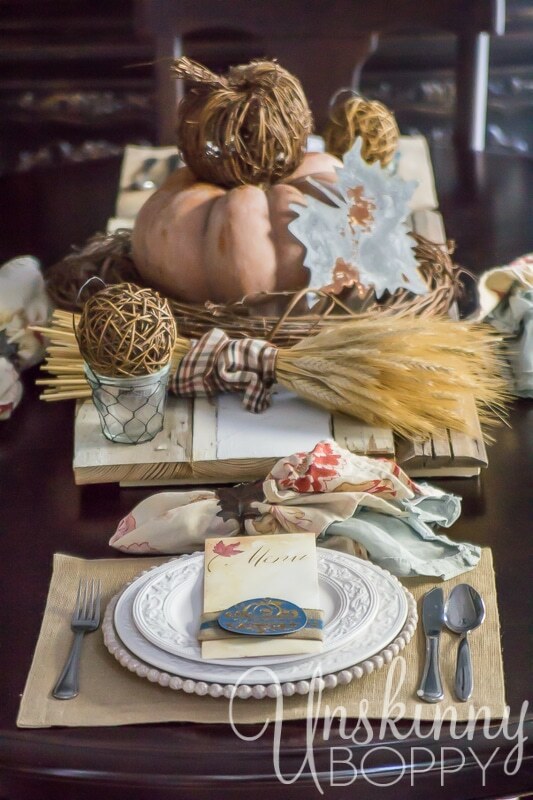 I love, love, LOVE this Rustic Thanksgiving Tablescape from UnskinnyBoppy.com! This table completely captures everything that is my creative style, so when I saw it, I knew it was one that I’d have to share. I love the wheat that is gathered on the table so effortlessly and the burlap placemats that everyone will find at their seat. Bring in some rustic decor with a slab of wood to put it all on for your centerpiece and it’s perfect! 5. What an Enchanted Thanksgiving Table! 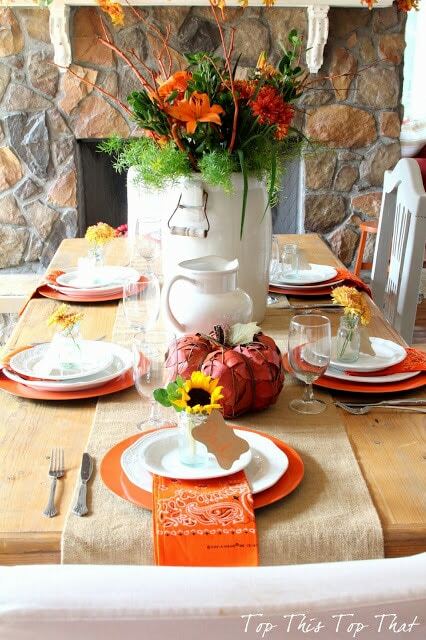 The WhiteBuffaloStylingCo.com went all out for this gorgeous Thanksgiving tablescape. This styled shoot took place outside, but this will work inside just as well. I just love the repurposed wood that has been cut up. For this table, logs have been sawed to make candle holders, as well as the chargers for the guests’ plates. And there are even some place settings that were made from wood! All of those candles…what a romantic and enchanted this Thanksgiving will be, indeed! 6. 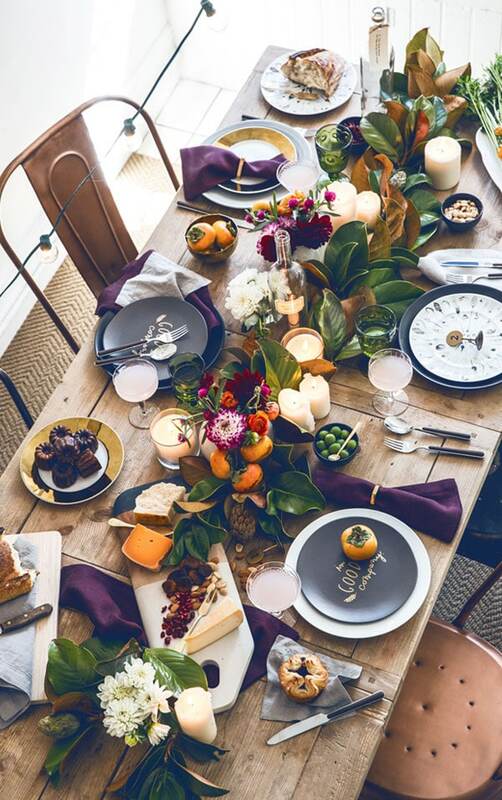 This Golden Thanksgiving tablescape from JustDestinyMag.com is so beautiful! 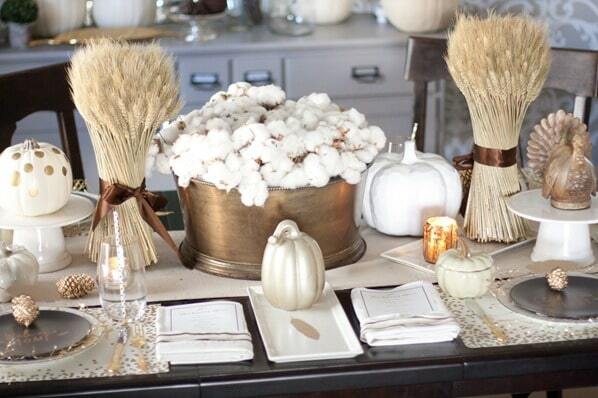 I love how the pumpkins are painted white and gold to go with the monotone color scheme for this table. There are even some gold polka dots painted. And how about that cotton centerpiece in the giant copper tub?! That is just such a unique and gorgeous idea. I always go back and forth on tables that are big and bright versus tables that are more low-key and I just love them all! 7. Now Festive Color Pop With Garland Centerpiece will get everyone in the mood for a bright and merry holiday spent with loved ones! Found over at Apartment34.com, this is mix and match! Don’t fret if you don’t have enough matching plates for all of your guests. Mix them up with what you do have and you’ll create an eclectic table that will be remembered all year! And how about that gorgeous garland centerpiece that was used with fresh greens and flowers?! Bring in that pop of gold and purple to the table and you’ll be creating a masterpiece. 8. 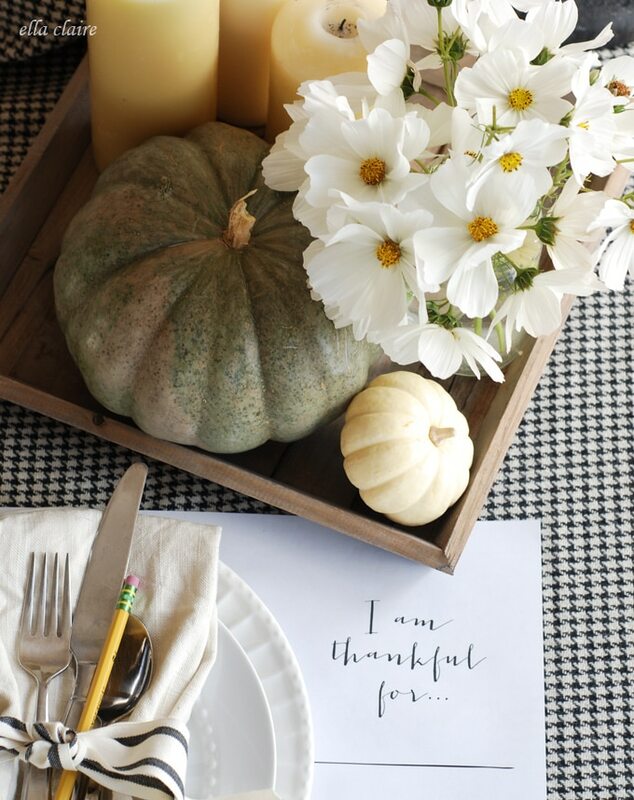 These “I Am Thankful For” Placemats from EllaClaireInspired.com are so sweet! I love having things like this included on my Thanksgiving table to remind everyone what this holiday is all about. Notice how everyone has a pencil tied in with their silverware? Genius! 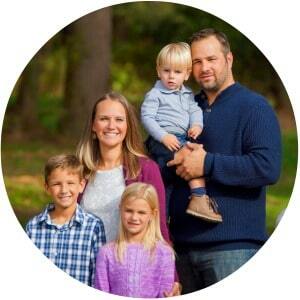 Head on over to the website to get this printable for your Thanksgiving table this year. 9. 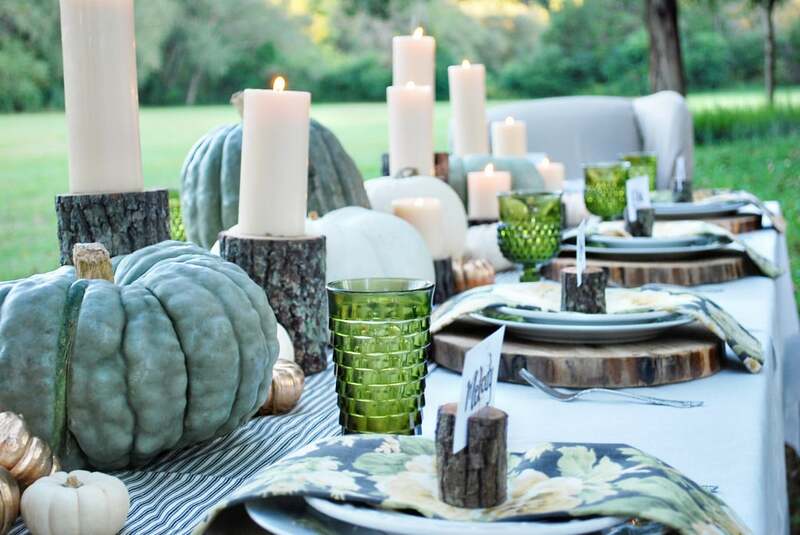 This Pumpkin and Gjord Filled Thanksgiving Table is simple, yet perfect! Again…it’s the best way I know to reuse some of the things that have been out on my porch or in my home to help decorate for the fall season. Bring it all together for your Thanksgiving Tablescape! JennySteffens.com throws in some branches and berries, and voila! You have a beautiful Thanksgiving table that took no time and is simple, yet elegant. Love! 10. 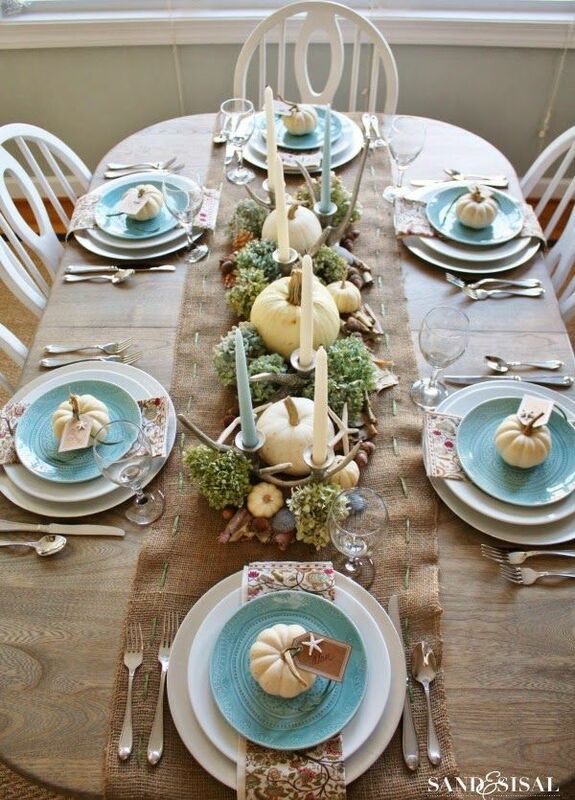 OK, this gorgeous Coastal Thanksgiving Table from SandAndSisal.com is just breathtaking! All I can think of is this perfect Thanksgiving holiday out on Cape Cod or the coast of Maine. I may just have to pretend that we live on the coast and tuck this beauty away for a future Thanksgiving celebration! It doesn’t matter to me that within minutes of people sitting down and digging into their meal, that my gorgeous Thanksgiving table starts to fall apart before my very eyes. To me, it’s a sign of a good meal, good conversation, and good times with the ones I love most. I hope everyone has an amazing Thanksgiving and creates the perfect Thanksgiving table for your holiday! Enjoy!